Everyone knows Ginger Rogers and Fred Astaire. 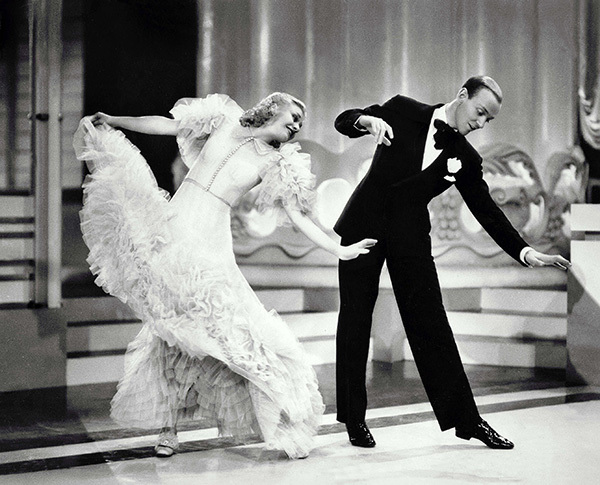 The ultimate dancing duo throughout the 1930s, the pair made nine films together. They symbolized “old Hollywood”, a time when life was simple and glamorous. They also symbolized the sexism of the Hollywood industry — paying Ginger half and working her double. Like all strong women, Ginger persevered with a smile on her face and went on to be considered the greatest dancers of all time — even with a partner who refused to let her lead or choreograph. Considered to be Astaire’s finest dance partner, Ginger Rogers held the impossible task of keeping up with a man who choreographed the dances for himself. “He was the one in charge. He worked on the routines as though he were planning a military operation. Every step that he intended to take was mapped out on paper by him in advance, and then on a blackboard. What Astaire was after, of course, was perfection. Indeed, he was such a perfectionist that after doing 54 takes of one shot on the Castles film, the cleaner polishing the dance floor noticed a stream of red sticky liquid leading to where Ginger was sitting. It was from her blooded shoes, the results of burst blisters. “All the girls I ever danced with thought they couldn’t do it, but of course they could. So they always cried. All except Ginger. No no, Ginger never cried”. In Ginger’s autobiography she vividly remembers this night as the night she bled though her shoes. They did so many takes, her feet blistered, bled, and the white satin high heels she was wearing finished he night pink because they were literally full of blood. And still they keep shooting. She keeps dancing. In her classic 1930s musicals with Astaire, Ginger Rogers, co-billed with him, was paid less than Fred, the creative force behind the dances, who also received 10% of the profits. She was also paid less than many of the supporting “farceurs” billed beneath her, in spite of her much more central role in the films’ great financial successes. This was personally grating to her and had effects upon her relationships at RKO, especially with director Mark Sandrich, whose purported disrespect of Rogers prompted a sharp letter of reprimand from producer Pandro Berman, which she deemed important enough to publish in her autobiography. Rogers fought hard for her contract and salary rights and for better films and scripts. Let’s take a moment to watch these dance clips of the two. Then there’s the filming complications… these numbers were filmed in ONE TAKE. So one thing goes wrong and you have to start over. Ginger had to contend with her wardrobe. Dancing in heels is the norm at this time, but dancing in a dress designed for cinema cameras… not so much. They were heavy, embellished, uncomfortable, restrictive and cumbersome and essentially a third member of the dance, strapped to the body of one partner.Not only did she have to dance and look good, she had to control the dress too.